Diary of a Wimpy Kid: A- for the kids, C+ for the adults! Our kids' summer break is winding down, but before they head back to school, they can enjoy the last few "Dog Days" of summer with Rowley, Greg and his annoying brother Rodrick, in the third edition in the "Diary of a Wimpy Kid" series. Since the "Diary of a Wimpy Kid" series exploded on to the tween scene in 2007, Author Jeff Kinney has released six books in the series and a seventh on the way in November, which makes one wonder, how many more Wimpy Kid movies are to come? This third "Wimpy Kid" film actually mixes parts from book 3 (The last Straw) and Book 4 (Dog Days) and gives us insight into what it's like to be a kid once again during summer break. It's quite funny how summer breaks really haven't changed in all these years. All I wanted to do was sit, eat chips and play my Atari and my parents wanted me to play outside, read or learn something. Yuck! See, you remember too, don't you? So what does Greg and Rowley do? What does every Tween do? Get in to trouble of course! As summer begins, Greg seems to think he can dupe his parents into believing that he's doing exactly what they want him to do, go outside and be active. But after going to the country club with Rowley, he finds out that he really does want to be outside, just in the lap of luxury. Even more so, after seeing his crush Holly Hills is a member, Greg makes it a point to be there as often as he can, even if he has to lie to be there. As the web of lies build up, so does the opportunity for disaster to strike and having Roderick around doesn't help any. The whole cast reunites once again in "Dog Days" with the addition of a new star named Sweetie, A doodle who steals the show and the roast while stage. Zachary Gordon and Robert Capron make a fantastic team once again as Greg and Rowley, but are sprouting up fast, leaving you to wonder will be back for a fourth film? Overall "Dog Days" will make the kids laugh out loud, will entertain the parents, if only while reminding them of their own summer break disasters, and will even end with a good moral lesson, as all good family films should have. A- for the kids, C+ for the adults! Download Diary of a Wimpy Kid: Dog Days from the iTunes Store in Digial HD. 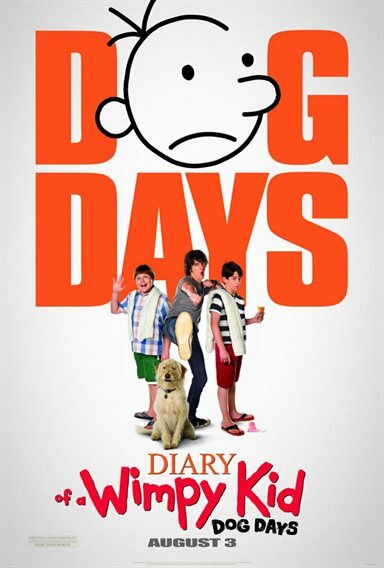 For more information about Diary of a Wimpy Kid: Dog Days visit the FlickDirect Movie Database.